Dr. Marshall joined a general practice residency at Summa Health System in Akron, Ohio, where he completed post-graduate study and gained experience in treating a wide variety of patients in a hospital setting. He also served as a team dentist for the University of Akron football team. Dr. Marshall is trained in all the fields of general dentistry, as well as the placement and restoration of dental implants, treatment of patients with special needs, and managing medically compromised patients. Upon completion of his general practice residency, Dr. Marshall entered private practice as a general dentist in Stow, Ohio where his practice emphasized comprehensive treatment. 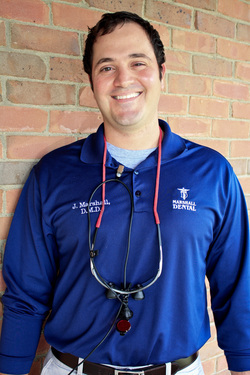 Dr. Marshall and his family returned to the Columbus area in 2010 and established Marshall Dental where he strives to provide the highest standard of customer care. In 2015, Dr. Marshall joined The Ohio State University College of Dentistry as an Assistant Professor in the Division of General Practice and Materials Science. Dr. Marshall enjoys staying up-to-date on the latest technology in dentistry to provide superior care. Dr. Marshall also has a keen interest in sports dentistry. While in dental school he helped found the first student chapter of the Academy for Sports Dentistry. When working with the University of Pittsburgh and University of Akron athletes, he managed traumatic injuries and fabricated custom mouth guards that help prevent concussions. He is a member of several professional organizations, including the Academy for Sports Dentistry, American Dental Association, Columbus Dental Society, Kiwanis International- Berwick Ohio Chapter, and the Ohio Dental Association.